I teach AP Biology, College Biology, and General Biology at Olathe West HS in Olathe, KS. 2018 Kansas Outstanding Biology Teacher Award Nominations Now Open! To qualify for the award, you must have at least 3 years of teaching experience, with a majority of that time dedicated to teaching biology. For instructions on how to apply, see the application requirements. Kansas has many deserving teachers. I look forward to reviewing your applications. I’ve been meaning to post about this project for a while now. This was our first major research project for my Biology 1 students this year. With Zika in the news all summer, I wanted to do a project incorporating mosquitos. 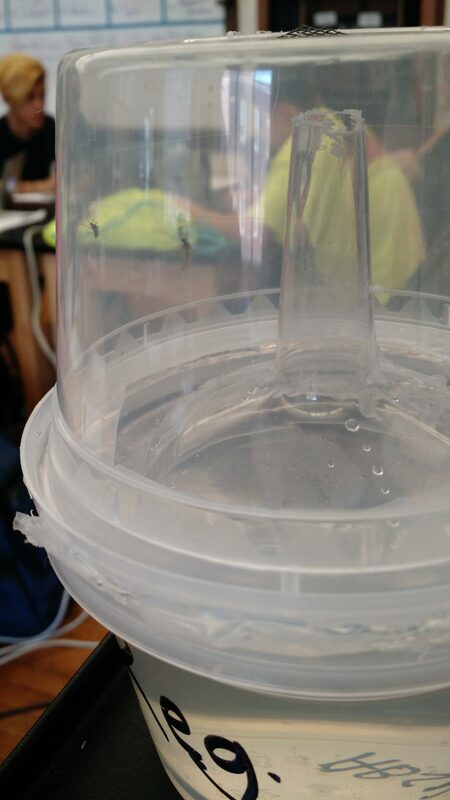 My vision for the project was to have students collect mosquito eggs, hatch them, then raise them in observation chambers subjected to different experimental variables. At the end, students would use their data to draw conclusions about mosquito behavior and life cycles. Students would collect data on the number of days until adults emerged, how temperature affected emergence rates, whether males or females emerge faster, and the percent of eggs that would make it to adulthood. Then students would use this information to develop a plan to slow the spread of mosquito-borne disease. I stress that this was my vision because this experiment didn’t work so well in reality. 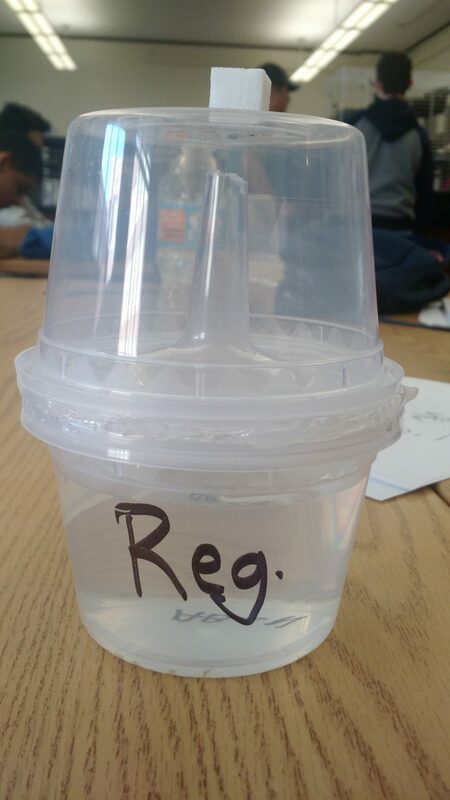 My students made oviposition traps using Solo cups, following the method outlined here: http://www.citizenscience.us/imp/, which is a wonderful citizen science project (talk to Noah Busch for more information!). Some groups decided to make more complicated traps. 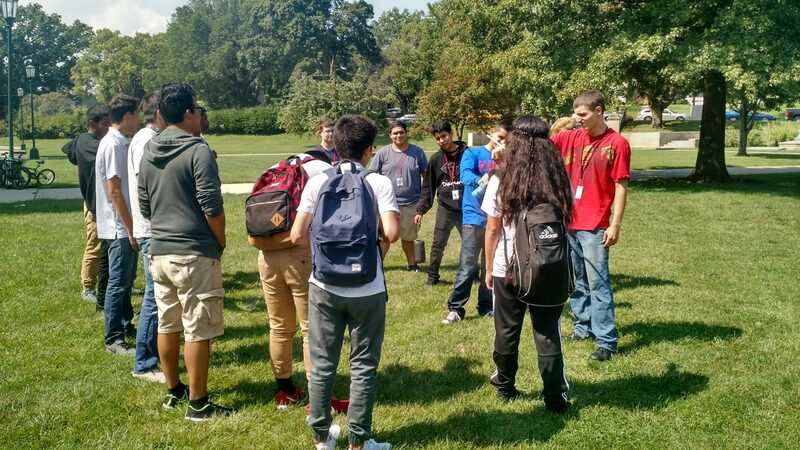 We placed the traps around campus, testing different types of sites, but we collected very few eggs! I was surprised by this result, but I found an aquaculture company to purchase mosquito larvae (Sachs Systems Aquaculture: http://www.aquaculturestore.com/Mosquito-Larvae.html). Spray-painting our egg traps black. After this initial hiccup, we had enough larvae to carry out the experiments in the observation chambers. I followed the chamber design from HHMI (http://www.hhmi.org/biointeractive/classroom-activities-mosquito-life-cycle). Some groups studied the effects of various temperatures, some studied the pH of the water, some wanted to look at the effects of light, among other things. We couldn’t afford as many larvae as I wanted, but we made things work by combining classroom data for students to analyze. Once all of the data was collected, my students made their conclusions about mosquito control methods. They presented their findings and ideas using posters. We had a poster walk, and students were encouraged to share feedback with each other. Hello! It’s been a while since we’ve had a post like this. Thought I’d share something I’ve done recently in my class! Right now I’m smack-dab in the middle of my biodiversity unit in my Environmental Science course. I like to save this unit for the spring so we can take advantage of the beautiful weather. We’ve been learning about methods for sampling biodiversity (quadrats), but today we focused on the question: Why should I care? I use this lab to model ecosystem services, such as water purification, to show students what conserving biodiversity can do for us. 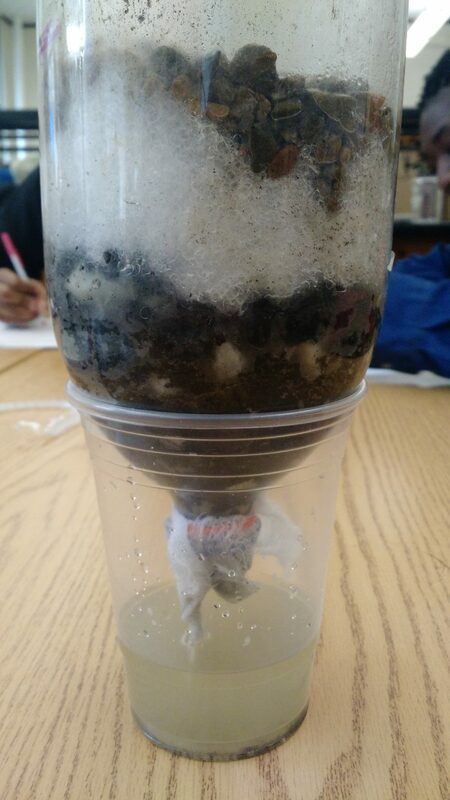 It involves using common classroom items to build a wetland filter to clean “polluted” water. If you’re not overly familiar with how wetlands function as natural filters, you can read more about it here. The filters are just 2-liter bottles with the bottoms cut off. I use a small piece of cheesecloth to cover the top to help keep the filter components inside. I supply the students with materials that function similarly to natural wetland components – cotton batting to act as roots, a variety of gravel sizes, soil, and sand. You could also add materials, such as clay, charcoal, or sphagnum moss. 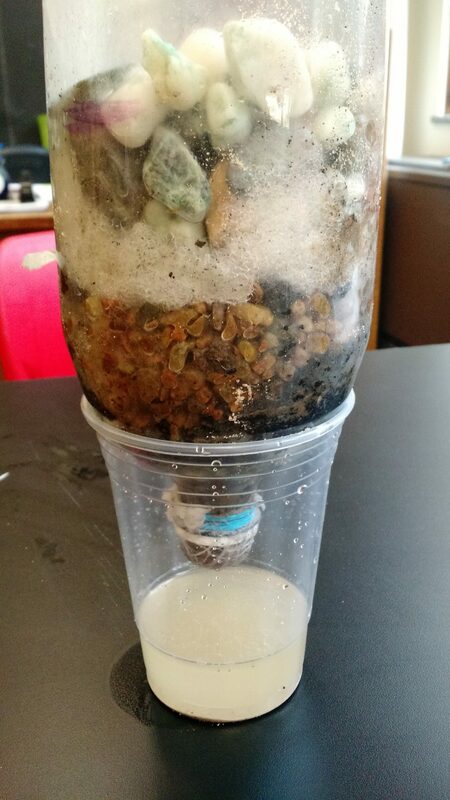 I have my students think about what each material might represent in real life and instruct them to build a filter that they think might resemble a typical wetland. The “polluted” water that the filter needs to clean is just a mixture of whatever I have laying around. Today it was soil, sand, diatomaceous earth, and canola oil. It looked gross when all mixed together and was made of materials that don’t dissolve in water, making them relatively easy to filter out. 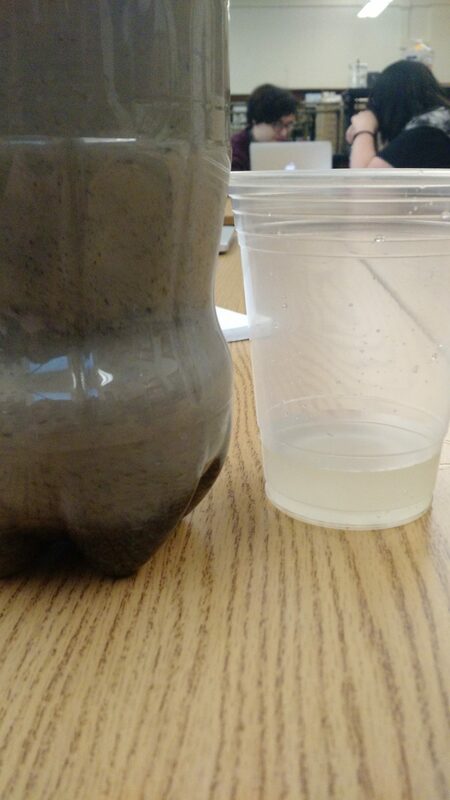 To save some time, we just compared the murkiness of the water after running the polluted water through their filters. You could get a little more involved and do some turbidity tests, if you really wanted. Peggy Porter – I’m lucky enough to see the cool things you do. You should share with the group! A few weeks back, I posted an article from Nature to the KABT Facebook page reviewing three board games that attempt to model the process of evolution. Brad Williamson was kind enough to make a donation of Nature’s top pick, creatively titled “Evolution”, to me and my classroom. In return, I was asked to write my own review of the game. I’ve had the chance to play Evolution with a number of people: a few of my college biology students, some non-biologist friends, and some biology graduate students. Our gaming groups have ranged in size from just two people to four, with the game supporting up to 6. Overall, the goal of Evolution comes down to making the most efficient species at obtaining food. This is done through adding and removing traits that help your species either become improved foragers or carnivores. Food in the game is often limited, leading to competition between your species and those of the other players. Species in the game can have up to three different traits, leading to 12,000 different possible combinations. Each game I’ve played required different strategy due to the large number of possible outcomes. Efficient species at obtaining food are able to reproduce and grow their population (or have traits that increase reproductive potential). Species with large populations are therefore harder to kill off, but it comes with a major drawback: you have to be able to feed them all. You can also control the body size of your species. This acts as defense against predators for herbivores or offense for carnivores. Other traits allow your species to evolve cooperative or symbiotic relationships with other species in play, helping carnivores hunt or herbivores defend themselves from being eaten. There are also traits that provide defense, such as burrowing, defensive herding, or climbing. With only three traits for each species, you are left with a lot of decisions. Do you build a species that can withstand the attacks of carnivores? Or do you build a species that is an efficient forager? Do you make a more risky, but also aggressive, carnivore? During one of my plays, I made tank-like herbivores that could withstand whatever attacks the carnivores could throw at them, but they weren’t great foragers. On turns where plant food was scarce, these defensive animals were facing starvation. Another game with four people, there were a lot of herbivores in play with traits to increase their foraging ability. Once a carnivore came onto the scene, it was able to feed without much to stop it. The art of Evolution is beautiful and creative, mixing real animals with imaginary ones. The build-quality is very good and the pieces feel sturdy. The rules are easy to learn, but there is a lot of depth to the gameplay. My students and non-biologist friends were able to pick it up quickly and enjoyed the game. The game does a great job of modeling the process of natural selection through demonstrating the evolutionary arms race. Species respond to their environment and adapt to changes in order to eat and reproduce. New species arise throughout the game, others go extinct. Other biological concepts are also prevalent, such as carrying capacity, limiting factors, and symbiotic behaviors. Evolution isn’t perfect, however. It is a strategic game, with players controlling how species respond to what other players are doing, and planning future moves, making natural selection feel a little too forward-thinking. If used in the classroom, this would have to be addressed. But overall, the big picture offers a surprisingly good model of evolution. I’ll be requesting a few more copies to use in my classroom, along with the expansion, Flight. If you need a belated Christmas gift for a biology-lover (or board game enthusiast) in your life, I highly recommend Evolution.